U Can't Anvil The Truth: 37,000 Year Old Tablet...Manufactured Reality Or Actual Artifact??? 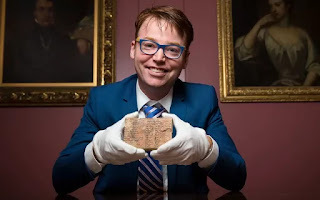 37,000 Year Old Tablet...Manufactured Reality Or Actual Artifact??? The tablet, known as Plimpton 332, was discovered in the early 1900s in Southern Iraq by the American archaeologist and diplomat Edgar Banks, who was the inspiration for Indiana Jones. The true meaning of the tablet has eluded experts until now but new research by the University of New South Wales, Australia, has shown it is the world’s oldest and most accurate trigonometric table, which was probably used by ancient architects to construct temples, palaces and canals. Very Complex picture decoded when you think on what's unusual in the photo and then applied Gematria decodes reveals that the tablet is a manufactured hoax.